The Atholl Hotel has 34 recently refurbished bedrooms, all with en-suite facilities, sky sports channels and complimentary Wi-Fi. 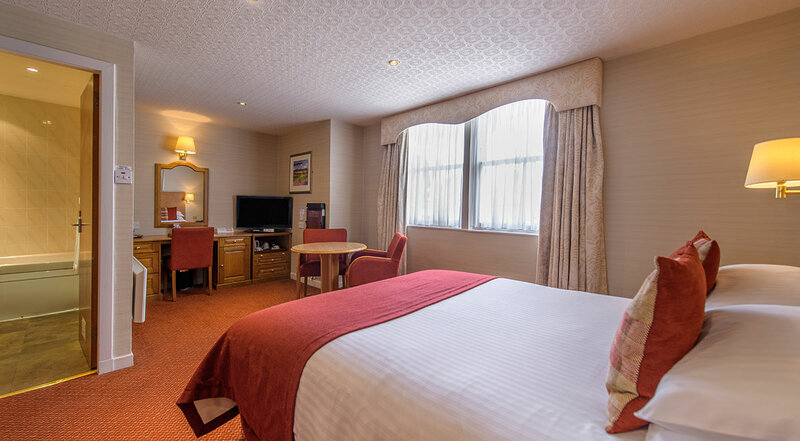 Our rooms are traditionally decorated with all the facilities one would expect from a Visit Scotland Four Star Hotel, each with satellite television, direct dial telephone, trouser press, iron and ironing board, hairdryer and tea and coffee making facilities. The Hotel has already undertaken major building work converting two rooms to have additional disabled facilities for our less able guests. We have also installed a passenger lift from the hotel reception area to the first floor bedrooms and function suites. Family rooms are available, please contact the hotel directly to check availability. All our rates are inclusive of VAT. Rates are subject to availability and change. * Midweek Rates are Monday – Thursday inclusive, Weekend Rates are Friday – Sunday inclusive. All reservations that fall between Monday 2nd September & Friday 6th September will be charged in advance due to Offshore Europe. These bookings will be charged on 1st August & are non refundable. Any booking made after that date will be automatically charged & are non refundable.